An inexpensive way to get the wireless vocal microphone job done but with tonal limitations. Ease of use. Long range. 16-channel true diversity operation. Tonally, it's a little dull. 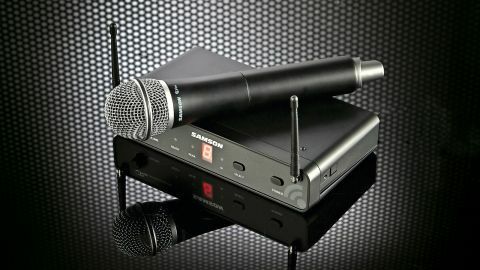 The latest wireless system from Samson, the Concert 88, can be purchased in several different forms - the basic receiver is packaged variously with headset mic, guitar belt pack, in-ear monitors or, as here for review, the Concert 88 Handheld with a dynamic vocal mic. The Concert 88 operates with analogue UHF frequencies and can be used on one of 16 channels and has a range of up to 300 feet. It's a true diversity design which sees the receiver fitted with two independent receiving sections, each with its own antenna. These are spaced at each end of the unit and the receiver constantly checks the pair to select the one that has the strongest signal. The idea behind this is to keep the signal strong as a dropout is unlikely to happen at the same time in both. If a dropout does occur, the receiver has tone key and auto mute functions to eliminate any background noise until the signal is restored. "As soon as the mic is turned on, it pairs up with the receiver and we had no troubles whatsoever with decent communication between the two"
The microphone has the standard onstage vocal mic look of a Shure SM58 but is a little fatter and about four inches longer to accommodate the transmitter electronics, and, despite looking quite huge, the body is made of plastic so is reasonably light. The lower half of the body is covered by a cylindrical sheath that can be unscrewed to reveal the battery compartment (the transmitter runs from two AA batteries which are not supplied with the package) and a small control (adjustable with a screwdriver stashed in the battery cavity) to set the required gain if you need to change it from the factory default. To turn on the mic you press and hold a switch on its body, indicated by a solid green LED that also flashes green to show low battery status. This doubles as a mute switch and it only needs a short press to mute the mic (LED turns red) so you'd have to be careful not to accidentally press it onstage. The CR88 wireless receiver is half-rack size and free-standing, although it does come with some brackets for rack-mounting if desired. It features both a balanced XLR output and an unbalanced 1/4-inch jack output on the rear - a jack to jack cable is supplied with the package. Output volume is set by a front-panel knob and the active channel is shown in a display alongside a pair of LEDs, one lighting up green to show when the system is paired up and ready, the other being a red overload indicator. A front panel button changes channels and can sync receiver and transmitter channels via an infrared signal, if you have several systems working together and need each to have a different channel. There are two sides to the performance of the system - how well the wireless system operates and what the actual mic sounds like. In terms of the wireless performance, as soon as the mic is turned on, it pairs up with the receiver and we had no troubles whatsoever with decent communication between the two. The mic features Samson's Q6 capsule as found in their standard Q6 vocal mic, which sells for a street price between £20 and £25, so we weren't expecting top of the range performance and we didn't get it. Tonally the mic is a little dull with a surfeit of woolly lower mids and a lack of crispness in the top-end when compared with an SM58, a mic specifically engineered to let vocals cut through. Having said that, judicious use of EQ on the mixing desk can get the sound into the ballpark with acceptable results. If you are a singer wanting to roam around the stage rather than stay in one fixed position, a wireless microphone is a definite temptation, and the Concert 88's budget price might be tempting. However, for crucial live situations you may wish to up the budget.